David Jacklin digs deep into the vaults of his own past to revive a show that he first performed when he was 21 years old – 37 years ago now – although David’s first performance as Mark Twain was at 12 years old! started out as a student exercise in 1977 and has been revived in several incarnations since then. 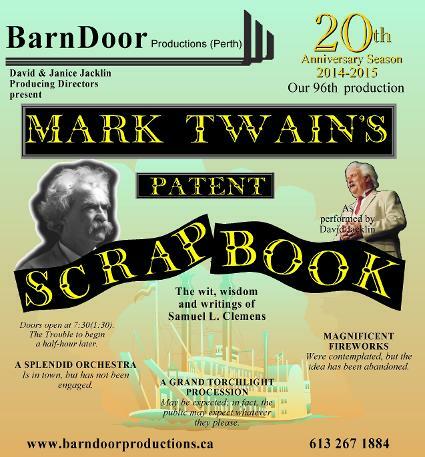 Given a major rewrite in 2010, to commemorate the 100th anniversary of Twain's death, the show has been brushed off again to open the 20th Anniversary Season of Perth's BarnDoor Productions. This is a 70 megabyte .MOV file. It should open automatically in Quicktime, but may not. You may have to download it and run it separately. Samuel Langhorne Clemens was born in Hannibal, Missouri in 1835, the year of Haley’s Comet. He drifted from place to place and job to job through his early adult years, until, in 1865, he came to prominence with a short story, The Celebrated Jumping Frog of Calaveras County, published under the pen name Mark Twain. As he put it, he “never did an honest day’s work” thereafter. Twain often joked that the book that made him the most money was his patented “self-sticking” scrap book, which sold over 100,000 copies. David Jacklin has taken the name for his one-man show, which is a collection of stories, writings and reminiscences from Twain's personal "scrapbook". Twain usually inserted the following into programmes for his lectures, which he continued up until just a few weeks before his death in 1910.
is a full evening of heart-warming entertainment. It is funny, insightful and moving. Audience comments include: "A tour-de-force! ", "A gem! ", "I can't tell you how much I enjoyed it." to simply "Thank you!" Performed in two acts, the show runs 55 minutes for the first act and 45 for the second. With an intermission, it is still under 2 hours. Utilizing only a chair, a couple of tables and a lamp, it is simple to set up and can be performed just about anywhere.